One of the themes I have always been attracted to are Civilization type games. Even in video games, I loved playing Sim City and Sid Meier’s Civilization. The thought of building up a great civilization from scratch and slowly changing over time gives me a great sense of acomplishment. I love how things can change throughout the game and will often evolve into different tactics that were unexpected as you go. I have always been looking for a game that simulates that in board games…..maybe I have found one in Nations by Asmodee??? 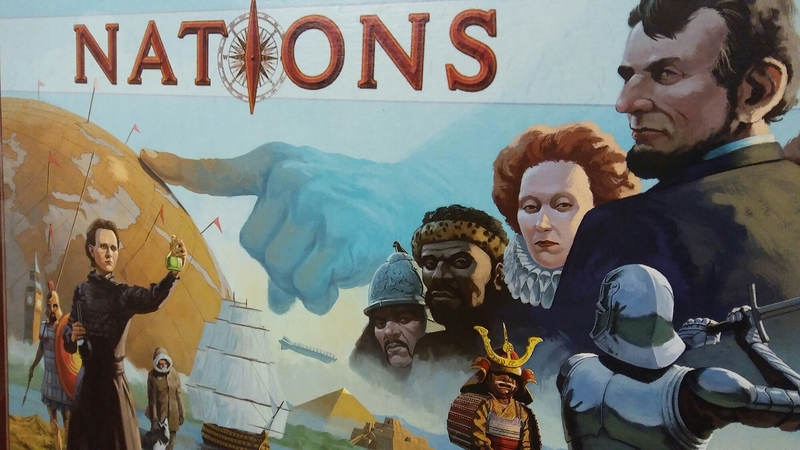 Nations is a game of deep strategy that has you leading a country through out 4 ages of time. Through out the game, you will earn points to determine who will be the greatest Nation. 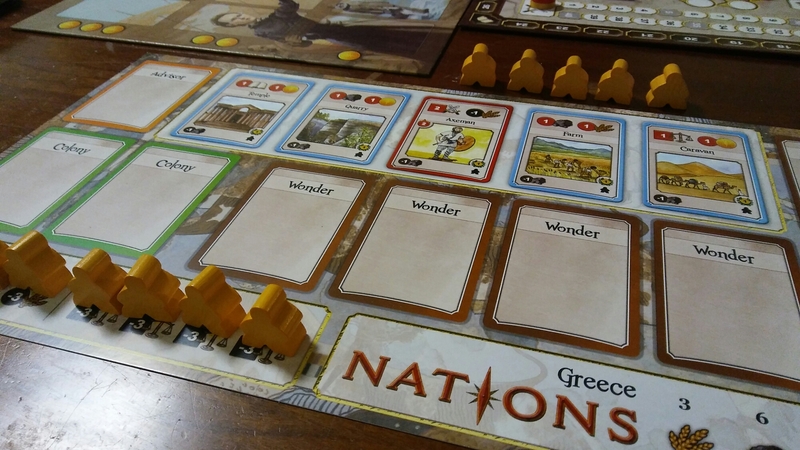 Unlike your typical civilization games, Nations is very European in game play. There is very little direct conflict but everything you do influences the other players in a big way. At the beginning of the game each player will choose a Nation to represent and colored meeples that they will use through out the game. On the player board of each country, there will be starting resources that you will collect. Each player will also put their citizens on the growth tracks on the bottom left side of his player mat. These will be available as you play the game. There are 8 rounds in the game and every 2 rounds will play in the same era of time. So, you will play the first two rounds from the first era then rounds 3 & 4 from the second era and so on. Each round will consist of different phases…..Maintenance, Action, and Resolution. Each of these phases have steps. In the Maintenance Phase, you get the board ready for the upcoming round, by adding an event card, adding progess cards to the central board, growing your nation and adding architects. Event cards will have an effect that will trigger during the Resolution phase giving you plenty of time to adjust. There are multiple progress cards to buy during the Action Phase. And when you grow your nation, you can either choose to get one new citizen or resources based on your difficulty level. If you choose to take a new citizen, then you will need to pay an upkeep cost for all rounds going forward to keep this new citizen. After the Maintenance Phase is the Action Phase. This is where the meat of the game is and tough decisions are made. During this phase you will take turns in turn order and complete actions one at a time until you have all passed. The actions that can be taken are; Buy Progress Cards, Deploy Citizens, Hire Architect, or use Special Action. All of these actions focus on the Progress Cards. During your turn you can buy a Progress Card. These cards will dictate resources your nation will produce, military strength, stability and books (representing education and learning). There are many different types of Progress Cards. There are buildings that produce resources and money. Advisors that will give you a specific benifit as long as they lead your nation. Wonders that will give you bonuses and sometimes Special Actions. Conquering cards will give you some resources that they provide you each round. Military cards will strengthen your military power. Golden Ages will give you a one time bonus. War cards can start a war with all the nations. The Progress Cards are usless unless you deploy citizens to gain the benefit. During the Action Phase you can spend stone, based on what card you want workers on, to put a worker on that card to activate it. It can have as many workers as you want on it. For every worker, you will gain those resources. So, if I have a Waterwell that gives me 3 stone and 1 food for each worker and I have 2 workers on it, I would get 6 stone and 2 food during the Resolution Phase. This also works with military cards. You do not need workers on Advisors, Colony or Monument cards to get the benefits of them. These workers will stay on those buildings unless you choose to move them, which isn’t a big deal….IF you have the stone to do it. When you replace a current building with one that you just bought, all the workers on that building come off and must be hired again…..using more stone. Stone is by far the most scarce and valuable resource in this game. One key thing you have to remember is the two different types of Icons. There are circle Icons and square Icons. Circle Icons tell you how much you will produce at the end of the round. Square icons give an immediate reaction. 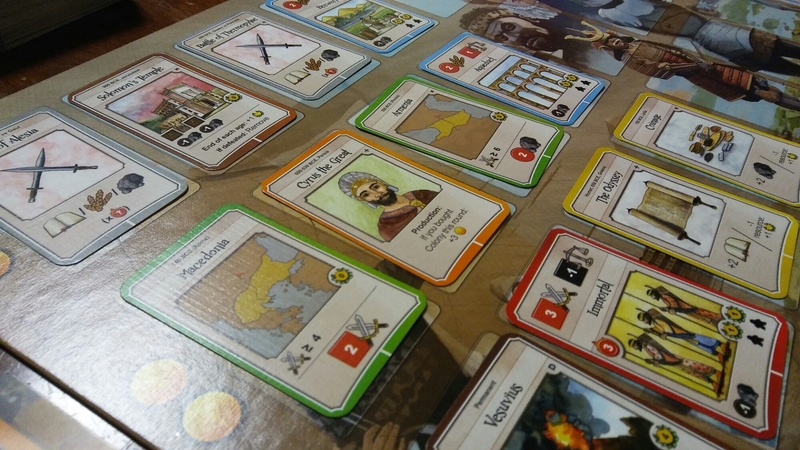 The square Icons seem to work mostly with Military and Stability and the circle Icons mainly are associated with the resources, including stone, money, and food. Monuments need architects to build them. When you buy a monument, it goes into the Under Construction part of your mat until you have enough architects to build it. To hire an architect you simply take an available one from the middle board and pay the stone cost. Once you have your last architect, place it in one of your Built Wonders spots. Some of your cards will give you special actions. This can be done once per round and only during the Action Phase. Each player will take one action in turn order until everyone has passed. Once everyone has passed, you go onto the Resolution Phase. During the Resolution Phase many things are going to trigger. This is when you get to produce all your resources. It is extremely important to remember that this comes first during this phase, because bad things will happen afterward. Next thing that triggers is the player order, this is determined by who has the highest Military strength. After player order, War happens. War only occurs when and if someone bought a war card during the action phase. The player who bought the war card will place the war disc on their current Military at the time it was bought. Then all nations who do not have a higher military than the War disc will suffer a penalty. Then, the event will occur. Yes, the Event is usually more bad stuff! There is usually a penalty if you are last in a certain category. After the event, everyone must deal with Famine. This is determined on the event card. Everyone must pay the required amount of food to cover from the famine. All of these bad things happen AFTER you produce your resources, but this makes it more difficult for the next round. At the end of each odd round, there will be scoring. Each person will score points depending on where they are on the Books track. You will get a victory point for each person you are in front of. After the eigth round a final scoring is made. You score victory points for citizens on your buildings and military cards, points for certain Monument buildings and for every 10 resources you will get 1 point. The person with the most points will win Nations. Most of the components are top notch. The meeples are bigger than I expected, big and chunky. Everything else is standard quality. 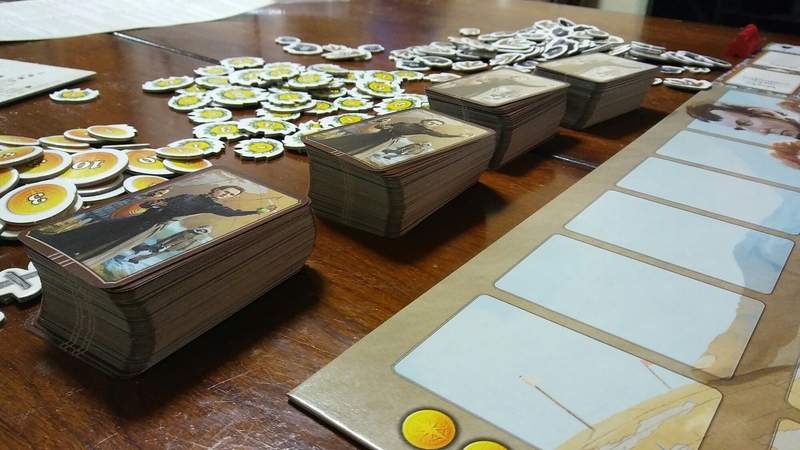 Thick, sturdy cardboard for the resources and the cards are nice quality also. The player mats are card stock, wish they were a little thicker cardboard, heaven knows they have enough room in the box. Which brings me to the overly sized, ridiculous box. It is way too big for the game. I know they did that so that there would be room enough to fit the player mats without bending them….so give me thicker player mats!! There are a few nice mechanisms in this game that I really enjoy. The first and foremost is the Deploying Citizens. I really love how this is incorporated. Once you put a Citizen or Worker on a building it stays there until you choose to take him off or build another building in its place. That really creates a nice balancing act of where do I place this worker to get the most benefit, because if I move him, I will have to pay the cost again to place him elsewhere. I really need to upgrade that building but I will need more stone to hire more people for that new building. Just a solid spin on worker placement. I also like the Wonders and Architect struggle. There are only a certain amount of architects available each round so if you have a wonder, you will need to get them early. I also really like the juggling act with all the resources. Stability is extrememly important if you are not going for military and wars. You need military for turn order, which is extremely important when it comes to buying Progress Cards. If you are first, you will get your pick of the best cards that will suit your chosen strategy. If not, you will have to pick from what is left. You need money to buy Progress Cards but need stone to put workers out. Books are great because you get victory points at the end of the even rounds. Military puts lots of pressure on other nations. A really nice balancing act that forces you to think about many things. I struggled on rating this. There is quite a bit of randomness in Nations. There are so many Progress cards in the game that the chances of certain cards coming out are slim. There maight be a round where you never see a building or military card. But then the next round you might get 4 building cards. That all lends itself to deep strategy also….right? Making the most of the oportunity given to you. There are also many ways to play. You can focus on one thing while others are doing another. Even though there is a bit of randomness, I feel the game is mostly about strategy and planning. The final round seems to be a bit of an anticlimactic ending. 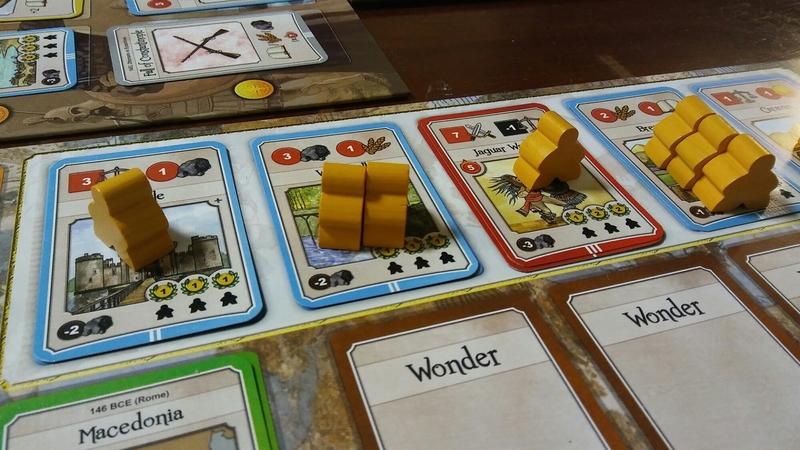 Most games you are trying to maximize your points by getting all the workers on buildings to score the most possible points or gaining the most resources you can just to squeek out another 2-3 points. This game can be played mulitple times and feels very different each time. Trying a new strategy each time will be at least 6 games. Playing a new Nation each time to get their unique ability will be another 6 times playing. Not to mention, if you get the expansion, multiply those numbers by two. There are so many things you can try and experiment with that each game will be new. The chances of you seeing the same card more than once in ten plays is pretty rare also. The game just begs to be played multiple times to find that combo of Nation and strategy that works the best. I really like Nations! It is my favorite civilization game, though I have not played very many. I like the Euro feel of it. Nothing is straight up conflict but many times, you are affected by what others are doing. Everything in the game can be negated. I never feel like I am forced into doing one thing…..other than get resources, but that is a given; right? The interaction between players is subtle yet meaningful. There are different strategies for people to use and all feel very viable. I love all the different nations to play, all with different abilities. The expansion would probably make this to an 18 or 19 because it adds more stuff, including being able to change your nation’s abilities. I will be keeping Nations for some time coming and will continue to try to get it to the table. It doesn’t hurt that it also can be played solo! !